No matter which way I go, I have to cross a bridge to get back home. Back to where I came from, the American Midwest, where much of my extended family still lives. And back again to Toronto, where I live now. Either way, back home. I could fly, but I need more of a transition when I go, an easing into it, a slower re-immersion. After all, it was a deliberate choice to live far away. When I left my home I was rejecting it. A divisive war made family relationships fraught and a campus bombing made the anti-war movement disintegrate. I felt helpless and ashamed of my country, and angry at my family for not seeing it as I did. It has always been hard to let that go. I put the Great Lakes between us. A few hours out from Toronto, driving through the sparsely populated countryside, I begin to anticipate the top of the bridge. The first glimpse always brings an ambivalent excitement; it marks the beginning of the transition. 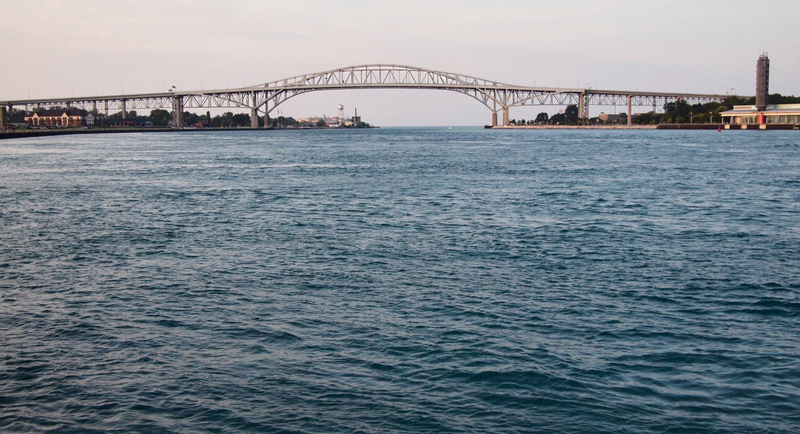 The bridges at Windsor and Sarnia are visible long before you get there, arching high over the shipping channel, which has also been deeply dredged, blamed by some for our current low water levels. Huge ocean-going vessels pass here, as I often saw from the shore when I was a kid. Summer afternoons on the Lake Michigan beach of my childhood, sometimes as we lazed in the sand my mother would point to the horizon. “Look, ore boats!” My younger sister kept staring intently one day, long after the rest of us had let our attention drift elsewhere, and finally said, “I don’t see any oars.” Low in the water the heavy-laden boats would be slowly making their way from the Iron Mountains on Lake Superior to the steel mills at Gary, Indiana. When crossing borders in other places – Europe, U.S. to Mexico, or even much of the Canada/U.S. border – you drive up to a barrier in the road, which corresponds to a line on a map. There is no topographical reason for this transition – it is arbitrary, a totally human hurdle, and seems almost petty. But crossing a large body of water is momentous. There is a landmass on either side of a major impediment. It requires collective action and feats of engineering to transcend the natural barrier. And the will to make that crossing possible rather than to reinforce the barrier. There is a physical separation and the choice has been made to connect. I pay the toll. Once on the bridge there is no going back. The car climbs the incline toward the apex of the bridge and I twist and crane for the exhilarating sight between girders of the great vista of the lake. At its height it seems you see the curve of the earth where blue water meets blue sky. 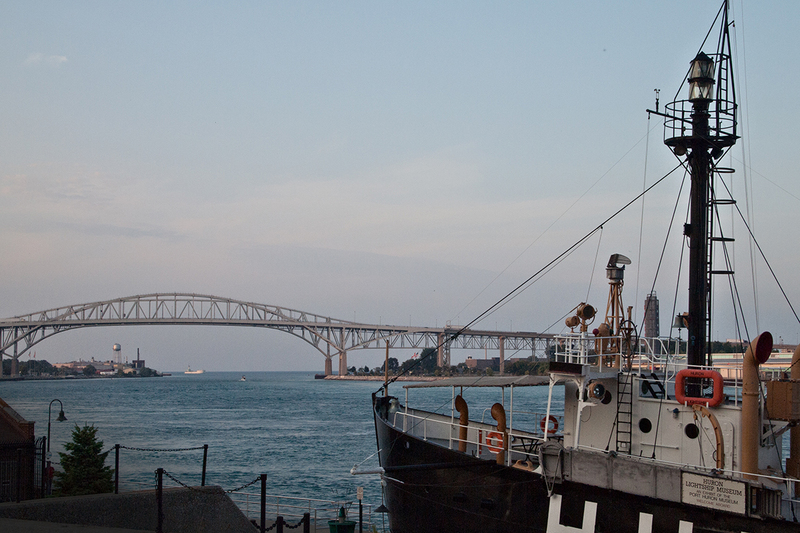 My hometown, like all the industrial cities along the Great Lakes, was built at the mouth of a river. The river water was opaque and dark; I wondered how it flowed into the lake and turned into clear blue lake water. Bascule bridges spanned city streets and opened from their center so that riverboats could pass back and forth in that constant transfer of goods that is a port. The bridge surface was metal mesh and as you walked across you could look down beneath your feet and see the brown river water far below. It felt so daring to stand at the middle where the two sides met, straddling the center, one foot on each side. What if the warning bell started ringing and the wooden barricade arm came down? What if the bridge opened right now? A tantalizing terror. What if? Each bridge had an operator in a little house beside the bridge and we were always reassured that he was watching and wouldn’t open it until we were safely across. Yeah, but what if? 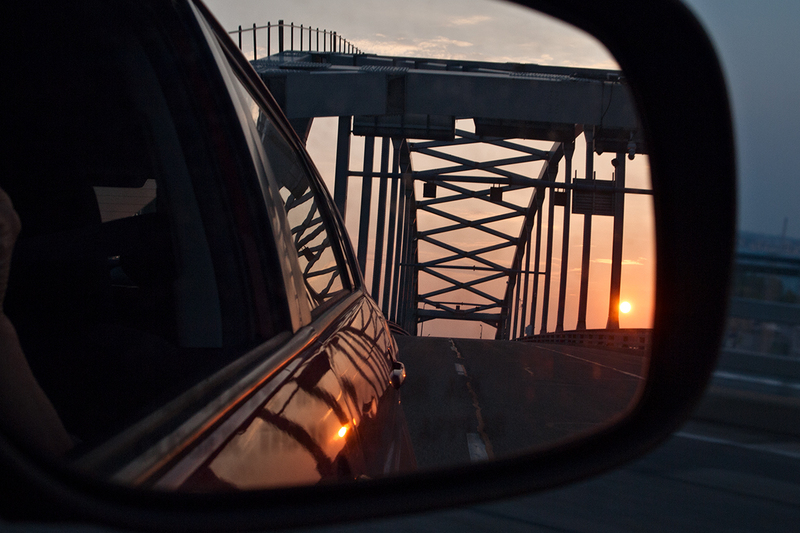 It was exciting and risky; you could have a sense of doom at the center of a bridge. Toronto is where I want to live, though there is much that needs changing here in Canada too, and that engages me whole-heartedly. I look with typical Canadian horror at much of what goes on in the U.S., but that doesn’t mean never going back. Yes there was a chasm, there is a barrier. But there is a connection. Looking down from high above as we cross, I wonder if what is between us might be just water under the bridge. 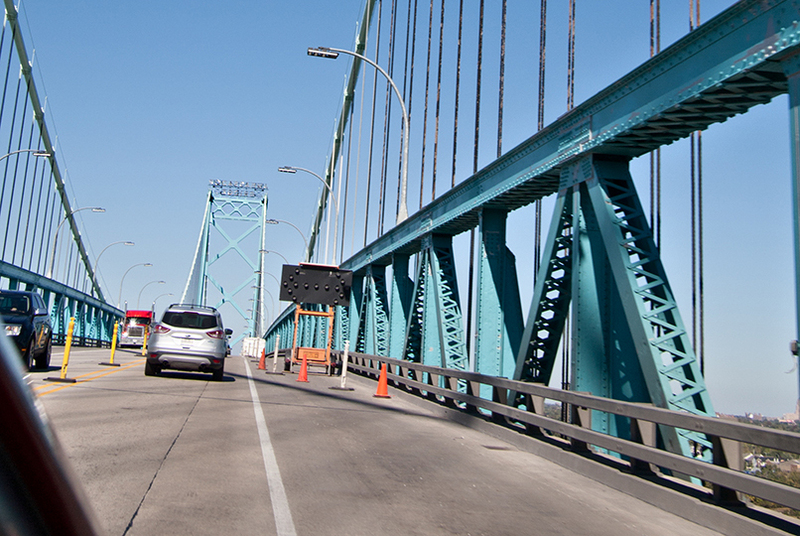 I enjoyed “Switching Sides…”, it’s a fab piece – “my” bridge is the one at Fort Erie. I’m always glad there’s water to cross and contemplate when I shuffle off to Buffalo. ‘Switching sides of the lake’ is a great reminder of all the talented people we were lucky to inherit because of that ‘divisive war’ in the U.S. 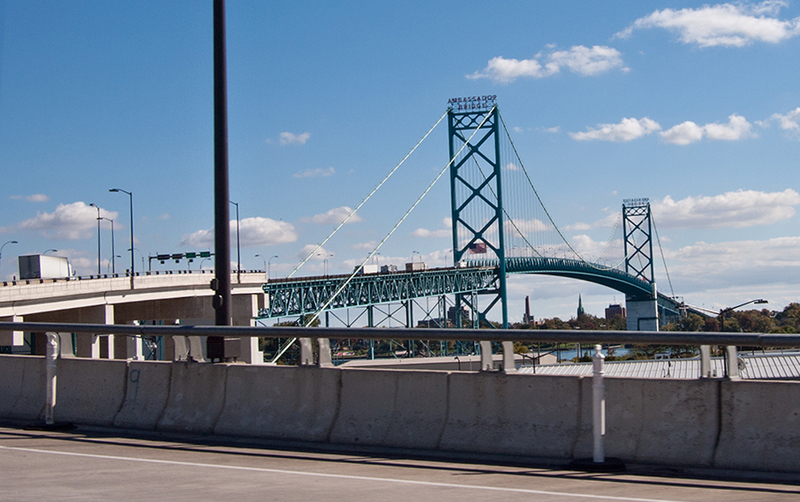 Tags: bascule bridge, crossing borders, dual citizen, going home, great lakes. Bookmark the permalink.